As busy as we are closing up our year, we can't stop thinking about the Christmas Holidays. In case you weren't aware, we are closed for two weeks to spend some quality time with our loved ones. However, we won't leave without giving you some inspiration for the holidays. Winter has arrived and holiday decorating is almost or already here. There’s nothing more exciting than putting up your Christmas tree while listening to some Michael Bublé. Wouldn’t you agree? 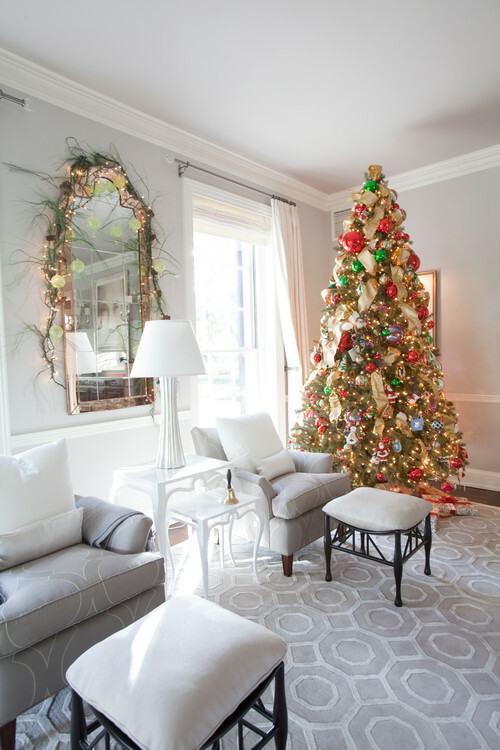 Listed below are 4 tips to get you ready for the holidays! Planning on having the family over for dinner? Here's how to have the perfect table arrangement. Get a centerpiece for the table. We absolutely love the look of garland. Add a few candles, some berries, and your table becomes very festive already! Add a wreath to your front door to show some holiday spirit or better yet, hang some around the doors inside! There's nothing like a real tree! Yes, it's messy but the fresh holiday scents and the experience are completely worth it! You can pick out and even cut down your Christmas tree yourself at Quinn Farms. It's such a fun activity to do with the family or a loved one! Enjoy the time spent together decorating your tree with the endless possibilities of choices! I especially love this Winter Wonderland look! If we were as patient as the person who decorated their home below, we would be welcome in Whoville! I've seen many houses over the past few years who take the time to show off their Christmas spirit and it's especially great for the little ones. 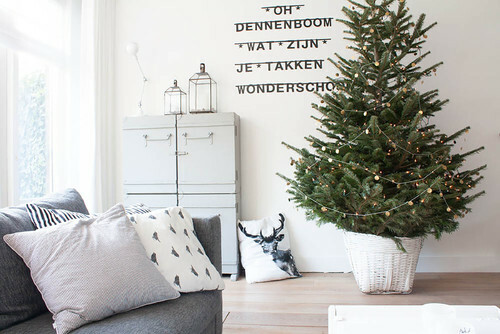 Hopefully, these few tips inspire you to be a little more festive this year! Just a few weeks left until the holidays and we haven't even bought our tree or started decorating. We are always so last minute, but who has time when work never quiets down? 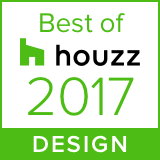 On that note, we want to give many thanks to all our clients who have allowed us to grow and work on so many beautiful projects this year. Merry Christmas everyone! Since the birth of baby Liam, Korina’s newest addition, we’ve had a bad case of baby fever. So we decided to round up a few inspiring nurseries for our readers to join in on our excitement. 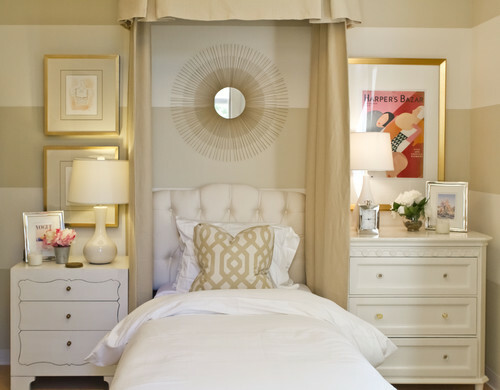 Listed below, are 5 nursery designs that will help you get ready for the big day! Have fun and explore the possibilities of creating a theme for your nursery. This theme is based on outdoors and adventures. We love the painted mountain peaks and the use of different hues in order to create depth. 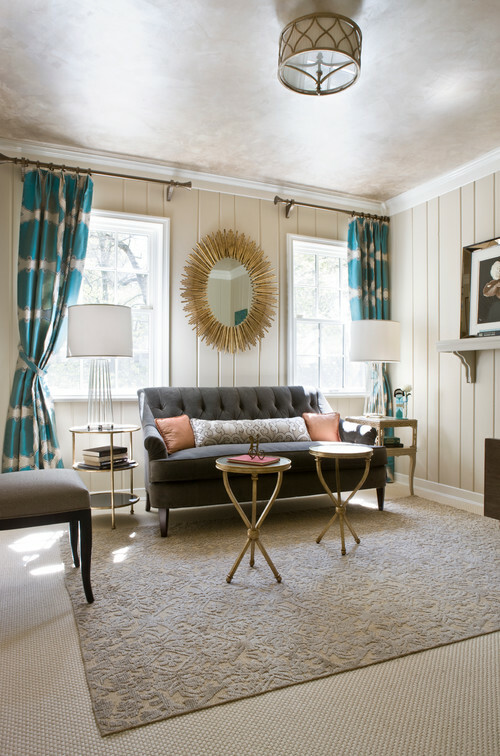 Creating a focal point allows you to keep the rest of your furniture neutral. Note that the theme is still very subtle. The worst thing you can do is overload on Winnie the Pooh decals! Keeping your main furniture pieces white and adding soft colours will keep your nursery fit for both genders! Perfect for those who decide to keep the gender unknown until birth. A modern and eclectic take on a nursery design. This design style is fun for all ages to grow into because of the use of many different colours. Instead of keeping your furniture pieces neutral, this a great way to keep your walls neutral and have fun with colour in your decor! If there’s ever a time you wanted to pair pink and floral together, when having a baby girl, you can! The colour pink tends to be feminine and therefore is considered girly, which gives us the perfect opportunity to go all out for a baby girl’s room. With soft pinks, whites, and warm wood tones, this nursery design is every mother’s dream to have. This little boy’s nursery has the perfect combination of soft colours and warm tones. We love painted designs or wallpaper on a crib wall because it fills the empty space without any additional furniture. Expecting a child on the way is always a stressful yet exciting moment. Therefore, I'm sure you have many ideas for designing your baby's room and we hope these have helped make a decision in which direction to take! Selecting new flooring can be overwhelming and although many adore hardwood floors and its timeless beauty, there are several different types of flooring that are quite comparable. We're no flooring experts but here's a bit of what we've learned from our trusted professionals along the way, that may help with you navigate your options. Solid hardwood is milled from solid lumber. Pros: Easy to maintain and can be sanded down and refinished several times. Adding a sealer easily enhances the durability of the wood and its resistance to water and staining without concealing the woods natural beauty. Cons: Wood shrinks and warps in response to moisture, which usually makes it a bad choice for basements where humidity levels are hard to control. It also cannot be installed directly on a concrete surface so in areas where a subfloor is not possible, solid hardwood wood is an unlikely option. Engineered wood is made up of a thin layer of solid hardwood on top and several wood plies (layers) that are fused together under heat and pressure at the bottom. Pros: Designed to reduce moisture problems that are associated with hardwood. It will not swell or warp, making it very strong and stable. Also engineered hardwood can go over concrete (great for condos). Aesthetically they are equal to solid hardwood floors, you usually can't easily tell the difference once they are installed, since the top layer is real wood. Cons: Veneers that are too thin will prevent sanding or refinishing. However, most engineered wood floors offer a thick enough veneer that allows you to sand and refinish 1-2 times. Engineered wood is a little more expensive than solid hardwood. These are the two main products that we use throughout a home. When considering solid hardwood or engineered wood flooring, you also have the option to go pre-finished, where the wood comes already coloured and varnished, ready to install. Or you can install raw wood planks and have them stained on site. Most contractors prefer the ease of pre-finished flooring. Sometimes we opt for unifinshed wood either to match an existing wood flooring that's staying in the project, or to attain a stain we were unable to find in stores. Laminate is composed of several layers of fiberboard materials with an image of real wood printed on top with a clear protective layer. Cons: Aesthetically, you can usually tell right away that a laminate is not real wood. It also doesn’t repair easily. If the flooring you choose comes in individual pieces, you may be able to replace each piece, but depending on sunlight and age it may not match entirely. Pieces of vinyl that are printed with a pattern that imitates stone or wood. Pros: Waterproof and very thin. Great for basements since it reduces noise levels. Cons: Subfloor must be perfect or imperfections show throughout. Although what's currently available on the market has been greatly improved over the years, since laminates and and vinyls are made of a printed image, you may see the pattern repeat if covering a large surface. Another thing to look out for would be models that also have a texture where the texture doesn't line up with the printed image. These are both signs that the product is not a real wood and would determine how good of a replica you get. Whether it's out of necessity or just for a change in look, new flooring can truly transform your home. We've really just scratched the (wood) surface in this post. You also have to consider the species, the installation technique, the stain colour and sheen. 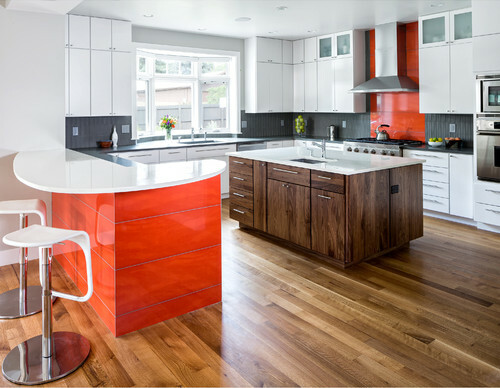 There's a lot more to learn on the hunt for your flooring product. We hope that this post answered some of your main questions and gave you some insight towards your decision! If you need help with the best choices for your individual needs, contact us today to shedule a consultation. Our guest blogger today is Korina Khamis; a Montreal based decorator who specializes in residential spaces. 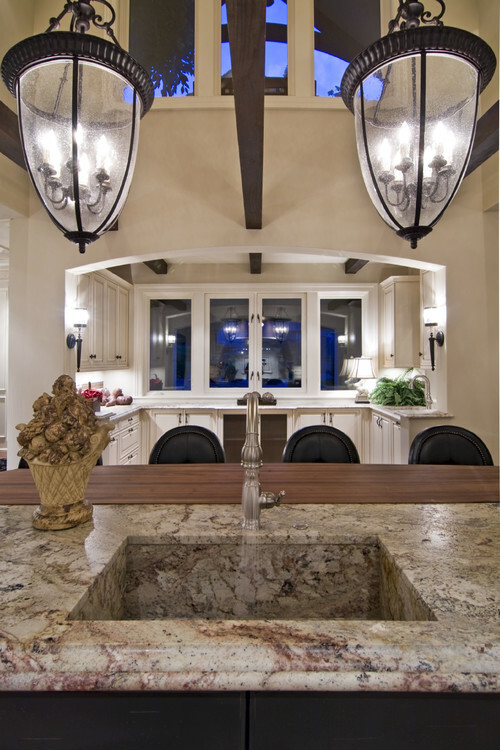 She has a passion for problem solving and a special talent for creating a beautiful visual balance in any home. 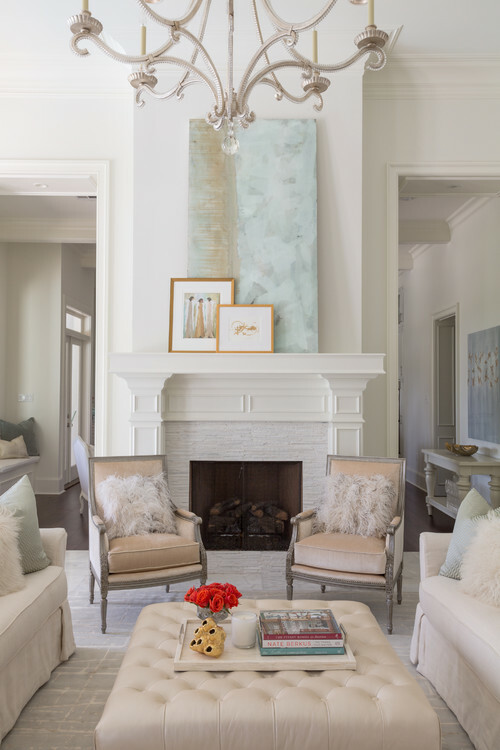 "As a decorator, I usually get to work with clients once all of the bones of the home are up, the walls are painted and some big pieces of furniture are already in. People think of calling me in at this stage of the project because while looking around they find there is something missing. Their space is lacking warmth, character, a personality and they don't know where to start. 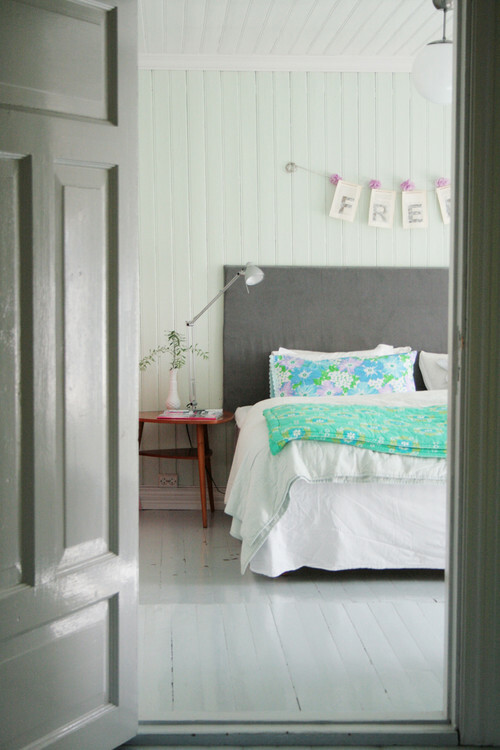 Hiring a colour consultant will give you a great start, but it shouldn't end there! Paint and furniture can only go so far and blank walls can feel repressing, much like a blank canvas. Look at what a difference the accessories make in the pictures below, without the art, throw pillows and drapery this room seemed dismal and all of the effort put into choosing the right paint colour would go unnoticed. It is important to decorate a space, and every space for that matter. Why stop with the family room when there are multiple walls and surfaces screaming for attention around your home; bedrooms, dining rooms and even the washroom should get some love. Many people feel that hanging art should cost a small fortune, but art doesn't have to be expensive, it has to speak to you. 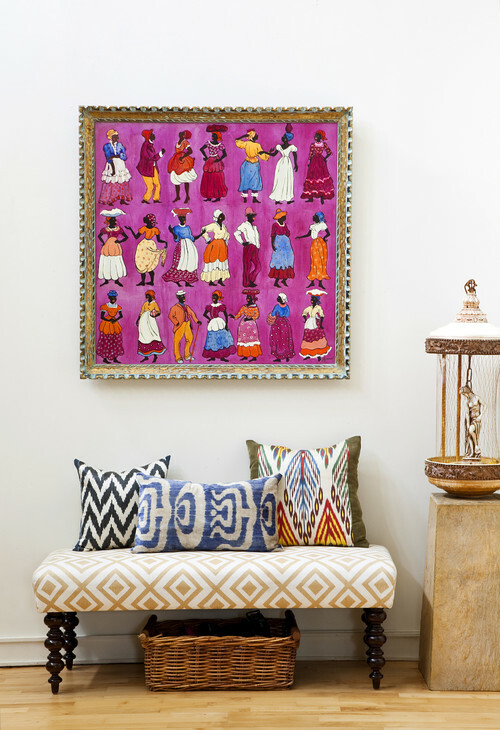 It can tie in the other colours around the room or it can stand out, but if you don't know where to start, use your art to help bring your space together. Missing some throw pillows? Try pulling a colour from your artwork for your pillows. Repeating colours will ensure that your home is cohesive which makes it feel put together and complete. Look to add texture in pillows, rugs or art to add dimension and visual appeal. Play will different fabrics, tone on tone patterns, and both mat and shiny finishes to give your space depth. Even the smallest surfaces matter, don’t make the mistake and overlook your coffee table or ottoman, entry way table or small shelves. It is the little details that can and do make the difference between a bright, fun and inviting home and a beautiful, but boring one." Call us today for help with all of your decorating challenges! Every day, I get paid to give people advice. This is how I make a living as an interior designer so it's no surprise that some of my close friends and family are a little shocked to see that I give away so many of my hard earned lessons, valuable tips and step-by-step instructions - for free - on my blog. I've given this great thought and here's why I do it. The do-it-yourself-er who is religiously reading my blog and following every last suggestion I make is not going to hire me anyway. Someone who loves a good DIY, will always want to do it themselves. It empowers them, it makes them feel accomplished and they genuinely enjoy it. Who am I to take that away from them? Instead, I'd rather give them a hand and even a push in the right direction. Either way, these readers enjoy learning from their own mistakes, so go ahead and get your hands dirty! The skeptic is that reader who is kind of looking for design ideas but doesn't know if they are ready to surrender their home to the aesthetic of a designer. Well, this blog will prove to them that I know what I'm talking about and that I'm able to communicate it. It will also show them that there is a lot more to think about than they could possibly imagine. This blog actually works in my favour with this kind of reader as it pushes them to seek the help of a professional. And finally, the shopper is the one who knows they want to hire a designer. They have ten websites of local designers open in tabs on their browser and now they just have to narrow it down to the right one. Sure, you can eliminate a few based on their portfolio but when you're down to comparing apples with apples, how do you make your final pick? Easy! Read their blog and find the one that you connect with the most. I can't tell you how many clients have told me that they feel like they know me through my blog and that they already know which design choices I'm going to lean towards based on what I've shared online. Welcoming a stranger into your home to help you change it is an extremely personal experience. You have to make sure that you can connect with your designer and that you will easily understand each other. Screening their blog is the BEST way for you to test the waters before you even spend a dime. All of that being said, I'm back to blogging with a vengeance! I've coincidentally bumped into A LOT of acquaintances and old friends lately that have told me how much my blog has helped them with their own renovation which really has given me a push to keep blogging. Are you a skeptic or a shopper ready to book your first consultation? Contact us today to get started! 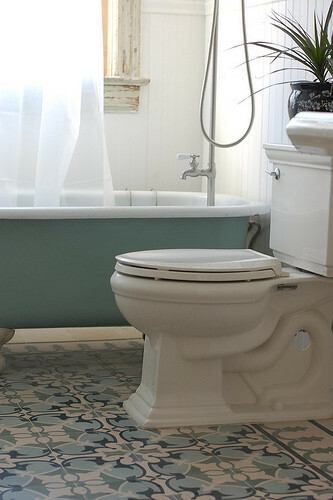 It can be very overwhelming if you're choosing bathroom tile for the first time. 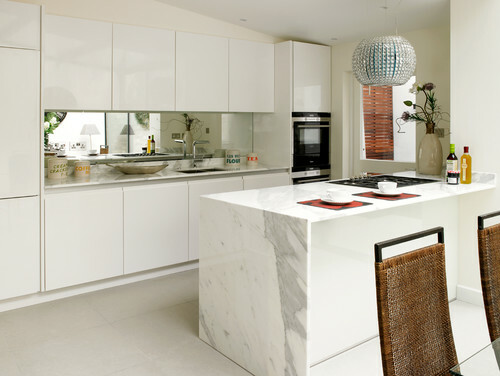 Tile stores can offer a huge selection which can lead to some very unsure decisions. 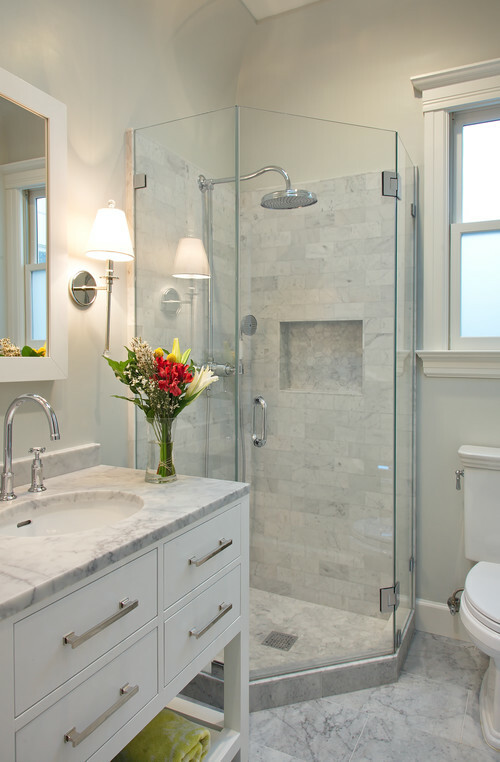 A full bathroom may include a floor tile, a wall tile and possibly a mosaic for the shower floor if custom built. Of course, you can always get creative and add accents, inserts, niches which usually just adds to the confusion and makes people even more indecisive. Follow this 5 step process for a simple way to get to your end result. STEP 1: Start with your must have. 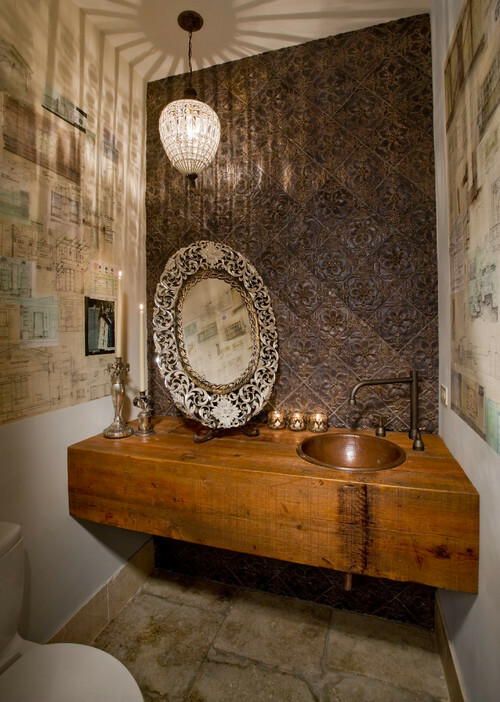 Pick a tile that you absolutely love that you want to build your palette around. 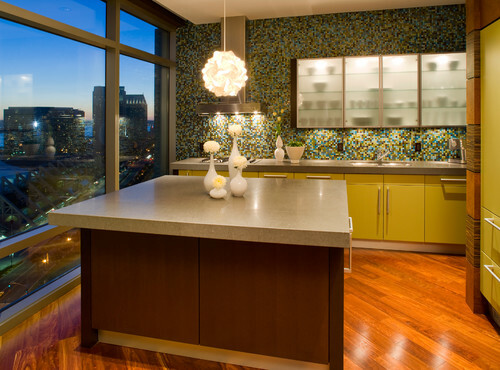 It can be the wall tile, the floor or an accent or even the countertop. This will simply give you a great starting point in a store with endless possibilities. STEP 2: Pick basic coordinating tiles. The rule of thumb in any room with fixed finishes is to have only one showstopper. Just like you wouldn't want a busy countertop to compete with a trendy backsplash in a kitchen, the same applies for bathrooms. 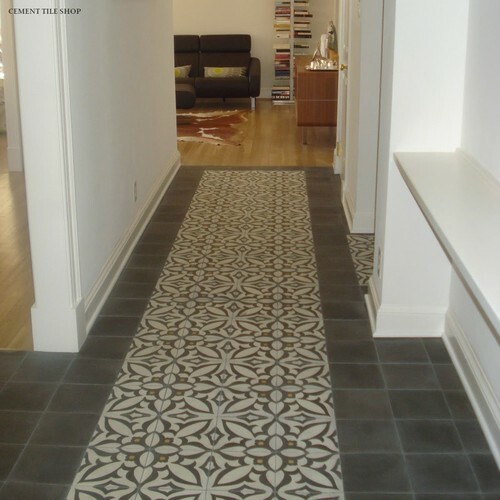 If you end up going with an intricate mosaic on the floor, keep the rest of the space more toned down. STEP 3: Repeat the same tile. Don't feel obliged to pick 5 different tiles for the floor, wall, shower floor, niche and accent. 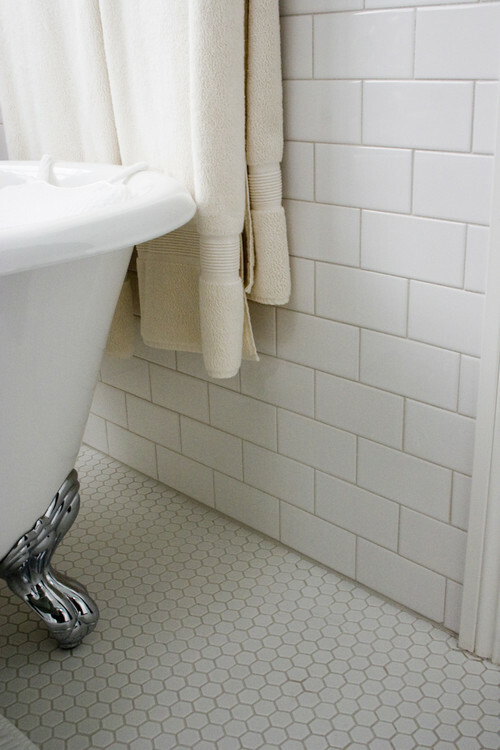 Repeating a tile will create a flow and will be easier to coordinating than choosing different tiles. When you have too many different finishes in one space, it will look too busy and if you're doing this on your own, you have a greater chance of picking something that will not match. Stick to not more than 3 different tiles in one bathroom. STEP 4: When in doubt, go with the same tile everywhere in different sizes. I do this all the time and I promise that the bathrooms I design don't end up boring or too simple. For example, I would use a 6"x24" tile laid in a herringbone pattern on a floor, the same tile in 12"x24" on the wall and the same tile in a mosaic pattern on the shower floor. The key to doing this right is to play with different sizes and pattern. This creates a texture that gives depth to the space. 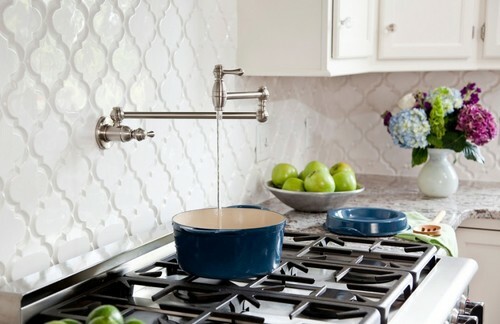 This is a good option for someone who will be installing a showstopper countertop or for someone who doesn't have the eye to coordinating the colours in multiple tiles. STEP 5: Ask yourself two questions to confirm that you've made the right choices. Will the plan I've put together work with the flow of my home? Or will you be walking into a completely different style/era? Unless, you plan on slowly renovating the rest of your home, I wouldn't do an ultra modern bathroom in a country style home. It's important that the design aesthetic for the bathroom you're renovating flows with the design and architecture of the rest of your home. Will I be able/willing to maintain the tiles I chose? If you love marble and plan on putting it everywhere but don't ever want to seal it or worry about toothpaste or water stains, than maybe marble isn't for you. You may want to consider using it as an accent instead or maybe look into porcelain replicas. 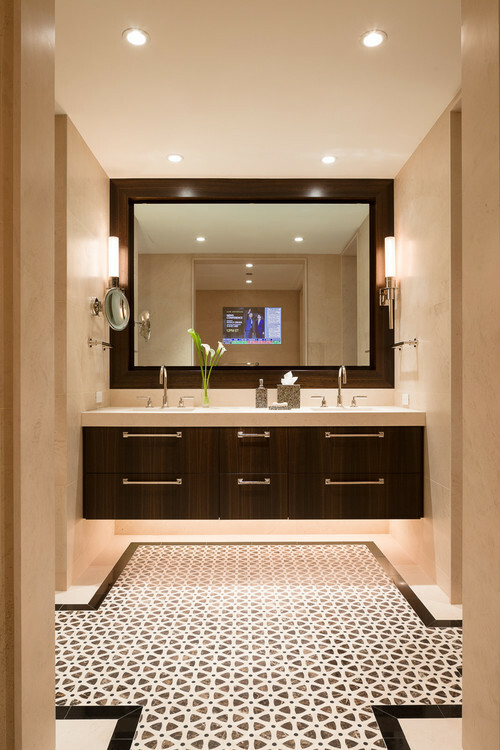 Need help with your bathroom project? Contact us to book a consultation! Regardless of how much thought you've put into choosing furniture, a space will not feel complete until the final details are placed. It's the finishing touches that make a space feel lived in and inviting. Here are my 3 top tips to styling your space like a pro. 1 - Try to decorate with what you already have. Useful things can be beautiful and no one wants to collect decorative junk that you will never use. Showcase your favourite serving dish or your antique tea set. Start in your kitchen; you never know what kind of gems you will find. 2 - Declutter. A) by bunching your decorating items. B) by using boxes to store jewellery, keys, bathroom necessities. 3 - When all else fails, nothing will warm up a space faster than fresh flowers. I like to keep a bunch of inexpensive clear vases on hand that I fill with flowers bought in bulk and disperse throughout my house. Hello again! I've been completely caught up in being a new mom that I've neglected my blog for the last 4 months. I know - it's sad. But I'm sure all of you moms out there can understand! Personal busy-ness aside, design is still always on my mind. Following my favourite blogs, Instagram and the few projects I've been working on have kept me in touch with my passion. Which bring me to my topic of the day; this past week, I've put together a few blog-worthy visuals of my top decorating dos and don'ts. Some of these may appear obvious to some of you, but I can't tell you how many homes I walk into with these common mistakes. 1 - Choosing the right area rug for your space. Size matters! Bigger is always better when selecting an area rug. It's so important that in a living room, the front legs of all of your furniture sit on the rug. This makes the room appear a lot larger. 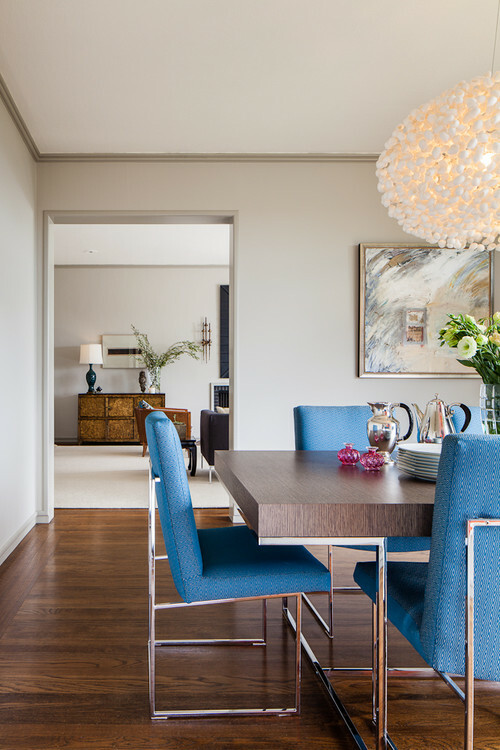 In a dining room, don't even bother with an area rug if the chairs will not completely sit on the rug WHEN FULLY EXTENDED. 2 - Art is a great accent in any home but nothing will throw me off more than art that is hung too high and not aligned properly. The center of your art should be hung at eye level. Your eye level, since you will be the one enjoying it the majority of the time. All of your pieces should also be aligned in the center. 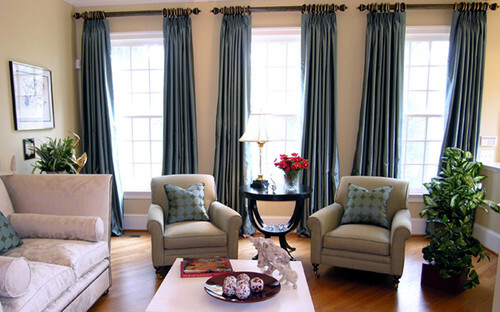 3 - Curtains should always be installed above the window frame. Closer to the ceiling, preferably. This will make your ceiling appear higher than it is. They should also be installed so that the panels sit on the wall beside the window when open. 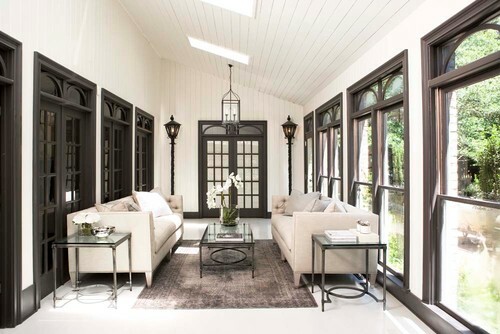 The point here is by installing your window covering around the window, and not over your window, you are creating a bigger window that allows more natural light to pour in. And who doesn't want more natural light in their home? 4 - This tip applies to renovations or new constructions but it will be a life saver when the decorating phase comes around. Install all electrical switches at 36" off the floor. It appears to be that eye level is the standard and I simply can't understand why. It makes it very hard to place art on your wall. It's an eye sore and I simply cannot find the purpose in installing it at eye level. It's even more comfortable ergonomically to flick a switch at 36". 5 - This may be a big surprise to some but your furniture should not touch your walls. Contrary to what you may think, by having your furniture float within the room, you are creating a more airy and open space. Leaving even just a couple of inches can make a difference if you're tight on space. I NEVER thought that IKEA would ever inspire me, but I have to admit that it's what opened my eyes to black kitchens. If you scroll down just a bit to my previous post, you will see that IKEA is coming out with a new line on February 2nd that includes a true black finish. 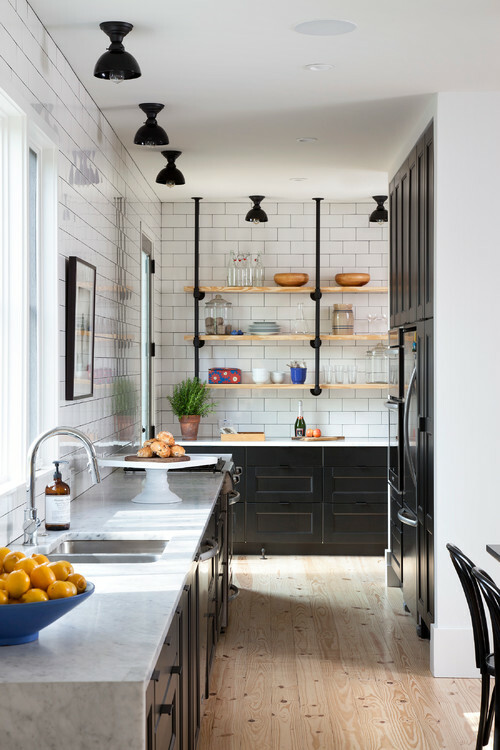 Well, I have to say that I kind of fell in love with the idea of a black kitchen from their photos. This is a shocker since I'm usually drawn to whites or pale blue-greys, but I truly believe that black (when done right) can be just as timeless. 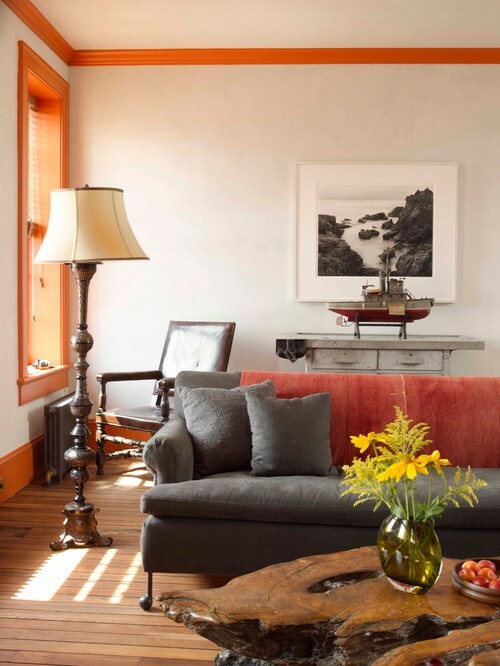 Here are some of my favourites that I found on Houzz. 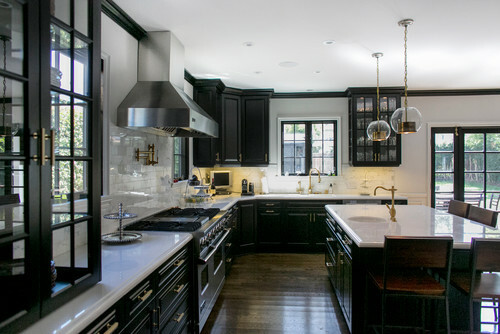 You will notice that a black kitchen does really well with some bling; pretty hardware, a luxurious stone counter, glamorous lighting. I do think that this particular style has to work with the architecture of your home and that it would look best in a space with high ceilings and good natural light. 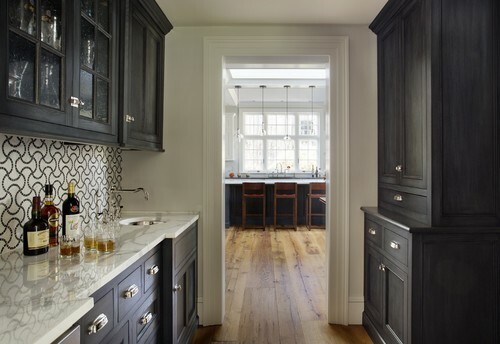 I'd also love to carry the black throughout the home on all doors and trim. 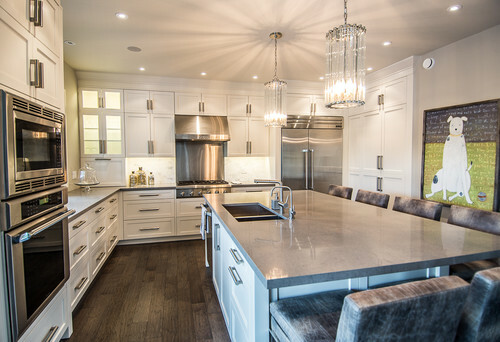 Traditional Kitchen by Toronto Interior Designers & Decorators BedfordBrooks Design Inc. 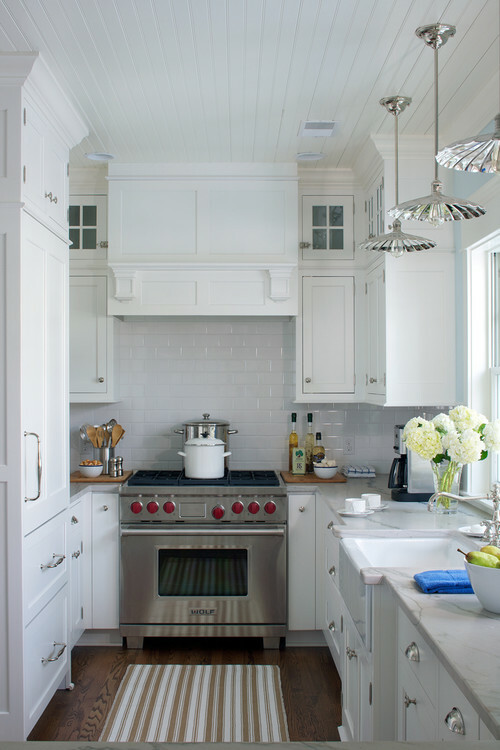 Traditional Kitchen by Boston Kitchen & Bath Designers Jewett Farms + Co. It's time to start decorating for CHRISTMAS!!! Okay, so I might be jumping the gun a little but don't judge me. If any of you have noticed, the stores are packed with Christmas stuff which makes this post 100% valid. I'm not entirely into the big, over the top, red, green and gold traditional decorating. Sure, if you have the right house for it, then I'd say to completely rock that style. For those of you with more modern or eclectic spaces (me!) that don't know what to for the holiday season, here are 5 tips that can get you on the right path. Tip #2: Don't be scared of bare or nearly bare wreaths and trees. Nature in it's simplest form could be all you need. 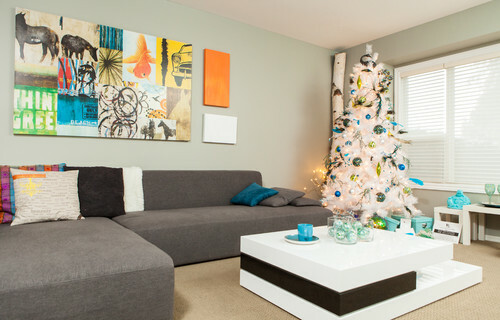 Tip #3: Fake, white trees are tacky. I have yet to see a white tree that I like. I really tried to find examples of the best decorated white tree to maybe change my mind but no luck. You may think it's modern but they're really screaming cheap. Tip #4: Red is a strong colour. If your space doesn't have any red in it, I wouldn't put any on the tree. BAM! All of a sudden, all we see is the Christmas tree. So much for hiring that expensive designer. 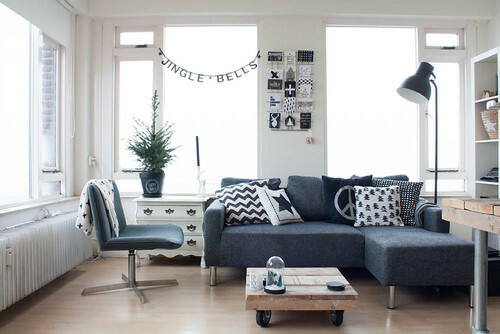 Tip #5: You can still be festive in a small space without having it take over your apartment. Since my last post about store bought curtains, I've been receiving inquiries about where to buy curtains that match my criteria; no grommets, long enough to touch the floor ect. Here are my top 5 stores both online and local. If you can't find exactly what you're looking for after browsing these selections, it's time for you to consider going custom. You will see that store bought curtains range from $20/panel to $400/panel. If you compare apples to apples, even the $400/panel ones will likely be less expensive than going custom. You will also notice that you still have to filter through all of the grommet panels if you want to end up with something that looks custom. Don't be tempted by some of the pretty patterns only available in grommet panels. 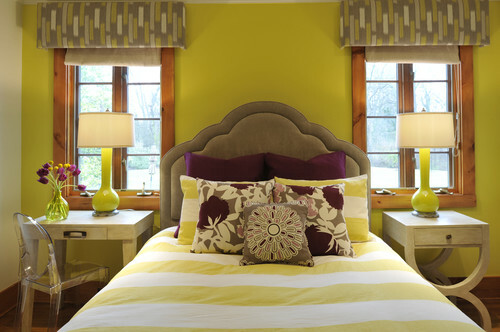 Still unsure about how to choose the right window treatments? Contact me to book a consultation. I once learned from a very well known blogger that personal posts are her most successful ones. I guess after religiously following your favourite blogger, you kind of start to feel that you know them and like to hear more about them. Well this one is a little about me - design tips aside. I've been blogging since March 18 2011. It started out with a way to generate more traffic to my website because a tech savvy friend told me that a regularly updated blog helps google recognize your site and will help bump you up in the organic listings. I've never been much of a writer and I honestly never expected for anyone to read my blog (secretly I had hoped that no one would because I was self conscious about writing). Since then, the majority of my clients who found me online have told me that it was my blog that convinced them to work with me. By reading my posts, they got to know me and a sense of my knowledge about design. That being said, I certainly was never told that I was a great writer. What's important is that my personality came through and my ideas were clearly communicated. Woohoo! So I decided to continue and I'm happy that I did. It's now become a regular part of my career and I really enjoy it. Besides blogging, I'm a self employed interior designer based in Montreal. I've been in the business since 2008 specializing in residential deslgn and colour. I adore my job because I get to work with great clients and nothing is more rewarding than seeing my design creations come to life. Hence the name; Triandos Creations. Since my family name (Triandos) is plastered everywhere, client's often ask me what my nationality is. I've been given everything from Spanish to Russian but I'm actually 3rd generation Greek. More Canadian than Greek, but none-the-less 100% Greek. I'm also a full time mom to my doberman/lab mutt, Congo (yes I'm that crazy woman who pulls out pictures of her dog when people are talking about their kids) and a devoted wife-to-be to my fiance, Alex. We all live in a duplex in NDG which is currently a full house because my sister, her husband and their dog are staying with us until their home renovation is completed. If you've ever wondered what the inside of this designer's home looks like, don't get too excited! You would maybe picture an ultra trendy, high design loft worthy of a magazine spread, but you would be mistaken. My personal style is much less put together and aimed to please the masses than most of the homes I tend to decorate. If I had to label my own taste in decor, it would have to be eclectic. I adore mixing old and new and having a highly functional space that is going to be used and abused. I would never be able to live in a space that is always in impeccable order with everything put away. That's where my creative side really shows; like any artist, I'm an organized mess. I also love colour and patterns and have been known to break the rules by mixing too many in my home. None-the-less, I love where I live and ultimately that's the goal! You have to be able to live within your own comforts and if I had to give myself a picture perfect, high maintenance home I would not be very comfortable. And somehow this post has found it's way back to design. Did I mention that I'm passionate about what I do? Hope you see at least that much from my blog! Congo the dog striking a pose. Alex and I abusing the photo booth at my sister wedding last fall. 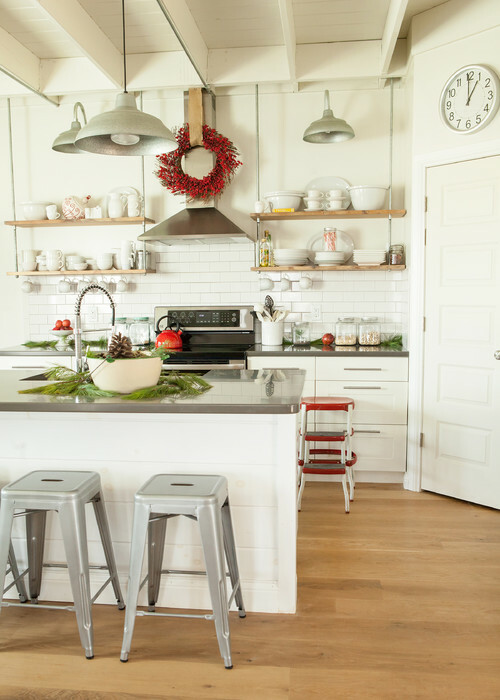 Here are some tips to take into consideration when decorating your space. 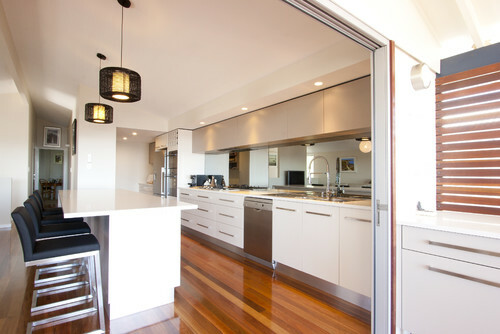 They may seam like small details but they make the biggest difference in the overall look and functionality of a room. The minimum break for drapery panels that hang to the floor is 1". Read my blog post To Puddle or Not To Puddle for more information on how to hang your curtains. If you are going to be tackling a new construction or major renovation, locate your light switches 36" from the floor so that they are not at eye level and so that they do not interfere with where you may hang your art. A dining room rug should extend a minimum of 36" around the dining table to allow room for all four legs of your chair to sit on the rug. For tips on choosing the proper area rug size in your living room, click here. If you're going to paint your walls white, you need art. PERIOD! No exceptions. Centre your art at eye level, never line up the tops or bottoms. Never install bathroom wall sconces above your mirror. It will cast a shadow on your face, which makes it difficult to put make up on. 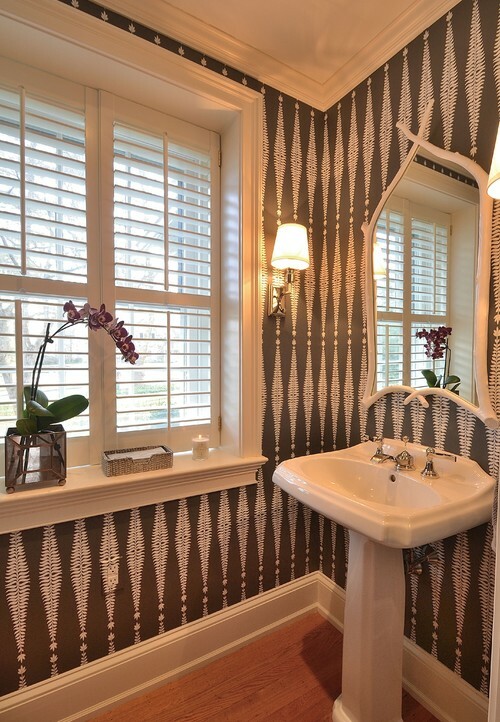 Instead, install your sconces at eye level on each side of your mirror. Everything else is more or less flexible. Rules=limitations, which is not something you want when decorating. These five tips are guidelines to prevent you from making common and costly mistakes. Considering a professional decorator? Contact me to book a consultation! My big highlight from this year's SIDIM was this wonderful gem of an artist that I completely fell for. Her name is Virginie Mazureau and she specializes in whimsical art that incorporates several different techniques. As you will see below, she has a very particular style that seams to capture the creative imagination of a child. My wonderful fiance and I loved her work so much that we purchased one of her prints. Here were a few of my favourites. As stunning as they are on screen, they don't measure up to the effect they have in person. These large scale originals are truly priceless, marvellously creative and highly detailed. This is the piece that captivated us and begged us to take it home. 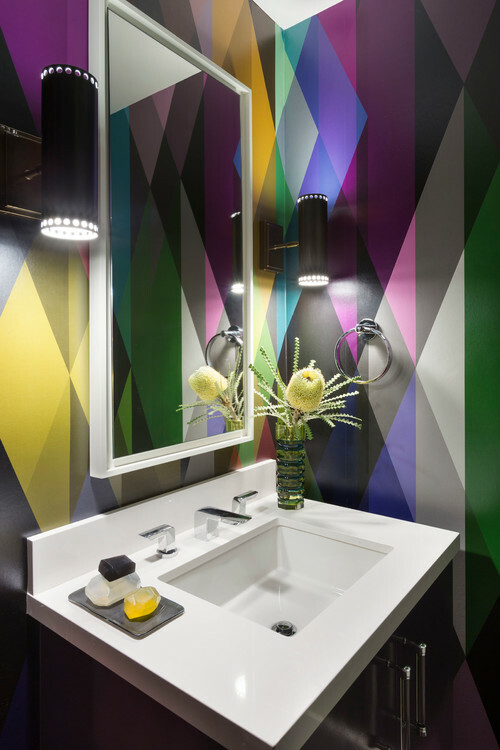 This year's Montreal Interior Design trade show had some hot finds. I usually find SIDIM to be a hit or miss but it's always a good idea to check it out to see what's up and coming in Montreal's design industry. From established suppliers to new and different products and companies, there's always something itneresting to see and pick up. A few stands really stood out this year. Stay tuned for some of my highlights. One thing that really stuck with me during Maria Killam's True Colour Expert Training was something she said about timeless design; "boring now = timeless later". People complain about not wanting to have something that looks like everyone else's space. They don't want something simple, they want wow; a colourful backsplash, an accent tile in the bathroom, a bright accent wall. Think about what that "accent" piece is going to do for you a few years down the line: it's going to age your space. It's the accent piece that catches your eye that will be the one thing in the room that tells visitors exactly when you last renovated. 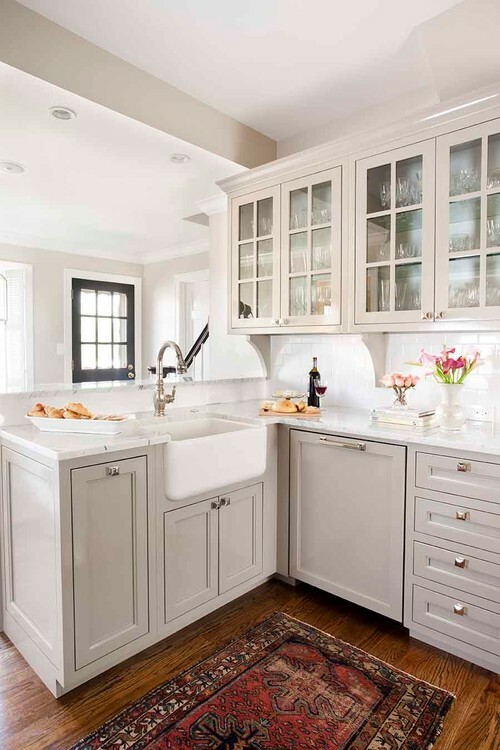 By keeping your hard, permanent finishes simple, neutral and timeless, you are avoiding having to re invest in your space in just a few short years. You can still decorate with accents that will bring your room to life that are a lot easier to change than tile, countertop or cabinetry. Creating a timesless space is good for your moral, your wallet and for our planet. Who really wants to renovate every 5-7 years? Wouldn't you rather do it right the first time and only have to play around with your soft finishes throughout the years? Trust me, I'd love to have the same recurring clients every five years, but would I feel good about that? No. I'd prefer for my clients to call me in five years to tell me how much they still adore their space and how it's aged so well and that when people walk in, they still tell them how beautiful it is. That's good design! Are simple, timeless finishes really that boring, once all put together? These are spaces that I consider to be timeless. 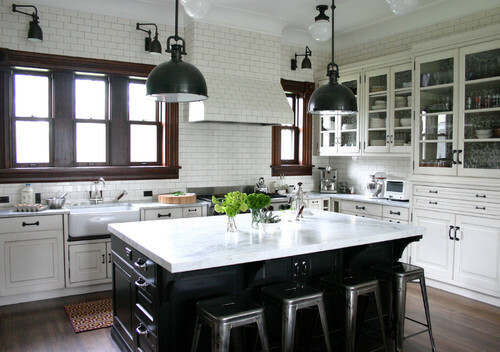 We still see subway tiles everywhere and they've been around for decades. The same for hexagone tiles, medium wood floors, simple stone counters, white cabinets. Can you tell when these kitchens were built? Do they look dated? Can I say the same for these kitchens? In ten years, will you still love them? Would you like to create a timeless space? Contact us to schedule your first consultation. If you're anything like me when it comes to plants, they won't last in your home for more than a week. It's become a real waste of money to keep spending on plants to try to make them work for me. A couple of years ago I purchased my first Lechuza planter and I can't tell you how happy I am with the results. They make it practically impossible for you to kill your plant and most of my clients would agree. The unique way that the Lechuza planter works allows your plant to drink only as much water as it needs. All you have to do is fill the water reservoir every once in a while, which also makes this planter ideal for the frequent traveller. If you're in Montreal, Alpha Plantes downtown and Jardin Jasmin in Ville St Laurent carries them. What I would suggest doing is having them plant it for you and maybe even deliver it to avoid any possible chance of you killing it (I take precautions so that I know I had no part in anything crucial to the life of my plants!). I actually still somehow found a way to kill my last Lechuza plant unfortunately. When we last moved in December, I unconsciously allowed my movers to move it and it got frost bite! Who knew that plants could get frost bite? These things should come with detailed instruction manuals. Anyway, it currently looks like bamboo since all the leaves fell off, so I guess it's time to replace it. Here are some pretty pastels from their new collections but they come in all shapes and sizes. You'll see that mine, in the corner of my former living room, is actually a lot bigger... and that was what my poor plant looked like before the frost bite. WHAT'S YOUR FAVORITE SPOT TO READ? In my profession, I really get to know my clients on a personal level and I've realized that every family works differently based on habits, comforts and functionality. I love that about my job. Learning the different ways that people live and use their space is fascinating to me. Today I snapped a great pic of my god sister reading a book in her favorite spot, under a beautiful lilac tree. What's your favorite place to unwind and read? I just completed Maria Killam's True Colour Expert training in Toronto and I'm proud to announce that I'm Quebec's first and only True Colour Expert. The last three days have been an intensive and detailed overview of interior colours and undertones. Maria is truly a genius when it comes to her business model and for having created a system for understanding undertones. I had had an incredible time being immersed in colour for three full days but what also made the experience were all of the other professionals that I got to network with and bounce ideas off of. I'm catching my flight back to Montreal tonight and I'm ready and eager to put the knowledge I've acquired to use. I've been advertising my colour consultation spring special until June 20, 2014 and I will still honor the $150 special until then. This is a great opportunity to take advantage of this rate before my prices increase. Book your consultation today. There are some pieces I own that I am so greatful for. This is one of those pieces that I think everyone should have at least one of in their home. The ever so versatile round side table. This one is mine, passed down from my grandmother that has so far had at least 3 purposes throughout it's lifetime. 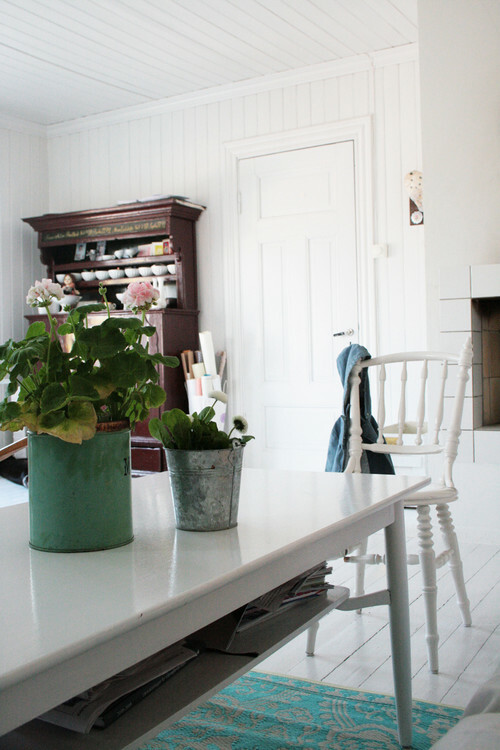 It can be a simple side table used to fill a corner as seen here or on the side of a couch. It can also be used as a night table, or as an entrance table to fill in an otherwise useless space with a pretty vase in the center. I've even used it as a desk. It's the perfect height, it looks great from all angles and will pretty much fit into any room serving a different purpose. 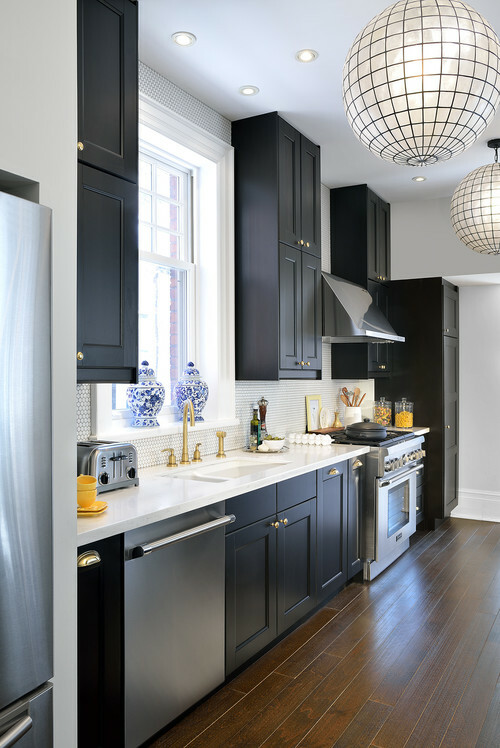 If you're tackling your own kitchen renovation and are taking on the task of choosing your finishes by yourself, I'd like to congratulate you for being so brave! It's not an easy task and most people in this predicament simply don't know where to start. After designing so many kitchens, I have this down to an art. I am proudly able to put a harmonious kitchen palette together in less than an hour jumping between 3 stores. This is because I follow a solid system that works for me every time. It's impossible to know what you like and what you don't like until you've seen hundreds of kitchens, even if only in images. Study them closely and take note of the finishes you'd like to use and the ones you'd like to avoid. You MUST have a solid idea or concept before you actually start to shop. You need to know your budget and what you are looking for. 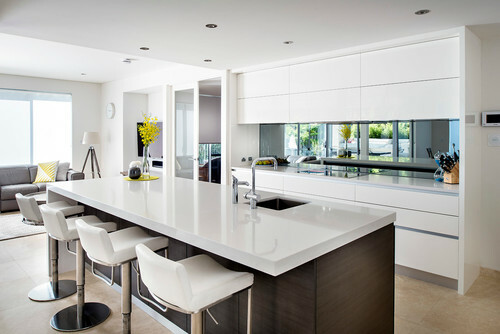 If things change along the way, that's fine but it would be a big mistake to walk into a stone and tile showroom and not have any idea of what you want your kitchen to look like. Trust me - you won't be inspired by the samples on the walls. You need to be inspired by actual spaces if this is not something you do every day. Houzz is a great place to start. One piece to the puzzle that will be your attention grabber; that is where you will start. 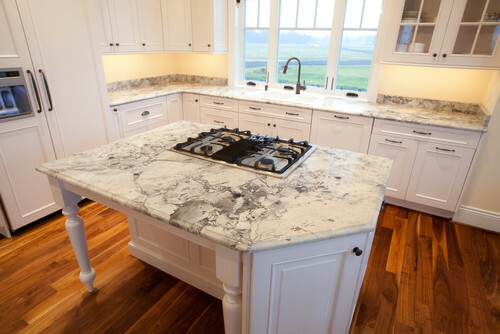 If you are going with a busy granite, start there. 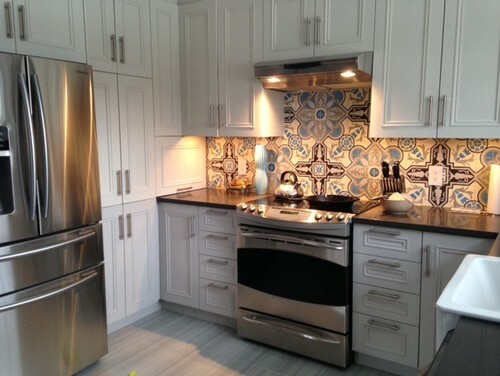 If you decide on a colourful backsplash, start with that. The idea here is to start with what is the hardest to find, what you will have the least options with. If on the other hand, you decide not to have a focal point, (which is not a bad idea) again, start with what gives you the least amount of options or what you have your heart set on. 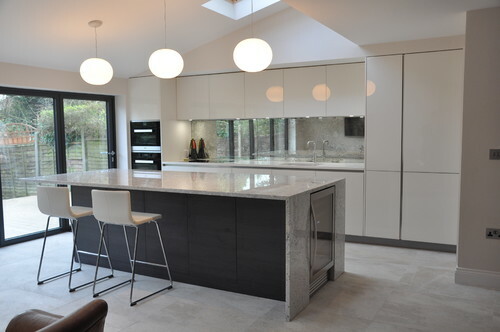 You really want a natural stone counter? Start by choosing your slab. 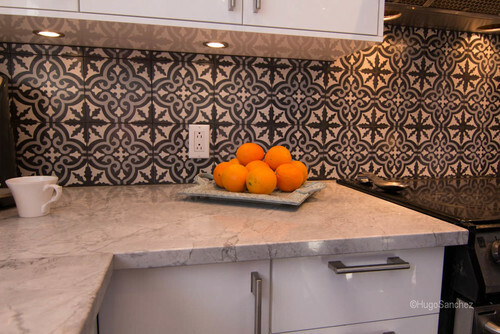 It's easier to coordinate your tiles to your counter than vice versa. So you've chosen the first piece to your palette. Great! Now closely identify the undertones present. If you don't know what an undertone is, it might be best to consult a designer from here. Make sure to understand which colours will best communicate with this first piece and stick to them. From here on out, it's all about comparing. Every piece you add to your palette needs to be thoroughly compared to the pieces preceding it. All of the undertones need to be harmonious. You can't compare if you don't have samples. It might be hard for you to get used to but you need to ask for samples of EVERYTHING you choose, everywhere you go. In this context, bigger is always better. 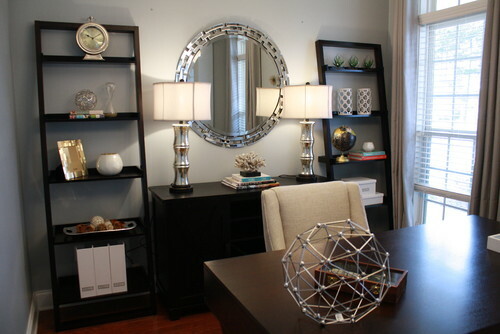 A bigger sample will definitely help you visualize your space and it will also help in identifying the undertones. Another good idea, is to get more than one option to bring home because your perfect palette may not be so perfect when you get home, which brings me to Step 5.
a) take into consideration existing finishes that you may not have considered at the store, like the adjacent flooring. b) better see the colours for what they are in the lighting that they will be installed in. The best thing to do would be to leave them there for 24 hours and see what they look like during the day and at night. c) prevent you from making an impulse decision that you may regret which can cost you thousands of dollars to repair. You are making a big decision that you will potentially have to live with for the next 5 to 10 years - sleep on it. 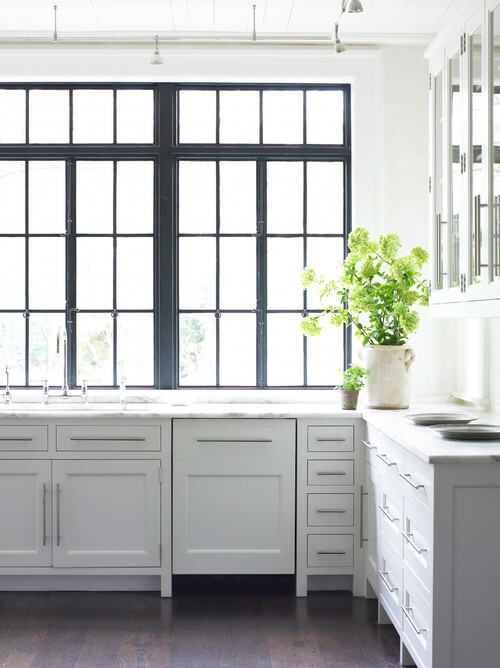 Follow these 5 steps and I can't promise you your dream kitchen but I am positive that you will save a lot of time and eliminate some of the most common errors made when choosing kitchen finishes. If you'd like a professional's opinion instead, whether it's from the start, mid way or just before you give the final okay, contact me to schedule a consultation. Like what you're reading? SUBSCRIBE to our monthly newsletter for more interior design updates and recent blog posts. HOW MUCH IS WORKING WITH A DESIGNER GOING TO COST ME? This is probably one of the very first questions people have about working with an interior designer. Most clients who call me usually start the conversation with: "I've never worked with a designer before, how do you work? What do you charge?". So much so that one of my very first blog posts was about working with a designer. This time around I'll cover more about how we charge, less about what we can do for you. Assuming that you already know about all of the advantages of working with a designer from my previous blogs, lets jump right into what it will cost you, not taking into consideration what we can save you. Some charge a flat rate based on your project size or budget, sometimes this is calculated by a percentage of what you spend on your renovations. Some designers charge hourly rates and take a commission on everything they sell you. This can get blurry considering we usually get discounts on most items and some designer will either just take the commission offered by the supplier while others will tack on up to 30% more. Other designers will charge an hourly rate and will not take commissions on what is sold. The way I work is by charging an hourly rate which includes conceptual work, consultation, drawings, shopping, on-site supervision and travel time if outside the island on Montreal. I don't take cuts on what I sell and I pass my discounts down to my client, but I charge for all of the time I put into the project. The reason I choose to work this way is because I find it to be the most fair for both my client and I. Through the years, I've learned that every project and every client is different. No two projects are alike, therefore I can give you an estimate but I find it close to impossible to specify a flat rate for any project. Plus, at the end of the project, my clients know exactly what they've paid for; how much I charged them and how much I saved them and I feel happy working with my clients to get them the best possible deals. A designer's hourly rate varies from $45 to $250 per hour. This rate is based on several factors. First, an experienced designer who really knows what they are doing will definitely be charging more than $45 per hour. A designers rate will consistently go up throughout their career as they acquire more experience and knowlegde through both their work and continuing education. I'm not saying that a designer who charges $45 per hour is not completely qualified to take on your project. I'm just saying that they may not have as much experience under their belt as one that is charging $200. Let's face it, school only gets you so far as a designer. Our real knowledge lies in the projects that we complete and the hiccups that we face along the way. Another hidden clue as to what a designer charges is if they have another income source like a percentage of their sales. Most designers consider this a big part of their income and part of their job. They may charge a lower hourly fee but they balance out with what they sell you. This "commission" is also a cushion or insurance for them in case anything goes wrong with the order, while other designers will have to absorb this cost themselves if a mistake is made. How many hours will it take to complete a project? 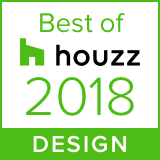 That depends on how big your project is, how well your interior designer understands you and what you want and if you prefer to be hands on or if you prefer for your designer to do everything from conceptual to on site supervision. A rough estimate for a full living room, for example, is between 15-25 hours. If you are working on more than one room at a time, it tends to take less time because you can discuss both space during consultations and we can knock off items for both spaces while shopping. Another thing to keep in mind is minimums. I require a minimum of 6 hours to take on any project unless it's a colour consultation which is usually billed at a flat rate. Some designers take a retainer before they start a project and others don't, some have contracts or letters of agreement and others don't. Bottom line is that every designer works differently and charges differently based on their experience of what works best for them. They will be upfront about it when you hire them and no matter what their agreement is, if it's the right designer for you, their service will truly be priceless. Like what you're reading? SUBSCRIBE to our monthly newsletter for more design updates and blog posts. Creating a picture wall can be a great way to fill a bare wall with everything from photos to art to memorabilia to wall sculptures. 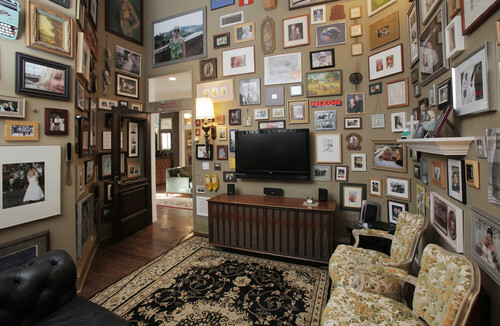 However, there is a very fine line between a nicely organized picture wall and a big mess. Have some kind of a structure or common theme. Choose one or more of the following: keep all of the frames the same, keep the frame colours the same, or limit yourself to two colours, use only black and white images, use only images of a certain colour, use similar frame sizes, use similar pieces; photographs, prints, paintings. Whatever it is, make sure that they have at least something in common. You don't have to cover an entire wall. Lay your pattern out on the floor first before mounting it. Space the images apart equally, closely together usually looks better than further apart. I usually allow 1"-1.5". Centre the grouping at eye level. As you should hang all art at eye level. Here are a few hits, followed by a couple of misses. Feel free to share your thoughts! Happy Hanging! HIT: Using a picture rail give you a tremendous amount of flexible and is a lot easier than perfectly hanging individual pieces. HIT: Do you have few, small photos that you want to display on a larg surface? Easy, using large framing! HIT: This is for the super structured type. Same frame, same size, same spacing, same colour. You can never go wrong with this much structure and you are sure to achieve a clean picture wall. HIT: Mix & Match done right! MISS: My two misses have the same problem. Too heavy, too many different frames, no common factor. Like what you're reading? 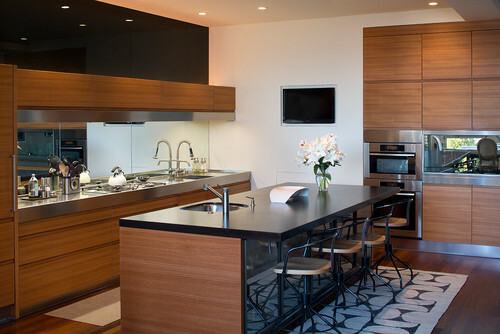 SUBSCRIBE to our monthly newsletter for more design updates and recent blog posts. This month is going to be all about colour because I just signed up to Maria Killam's True Colour Expert Training in Toronto next month and I've got colour on my mind. I give tons of colour consultations and the biggest mistake made when choosing colours is the timing. During a construction, renovation or move, the ideal time to paint is before construction is over, while the construction team is obviously still working on your place, right? This means it's before any of the furniture is in, sometimes before the floor is even in which means the kitchen is not installed yet, the countertop is not there, the backsplash probably hasn't been chosen yet and the client is open to any suggestions I give them. At this stage, I can give you ANY colour in the world and it will look fine because we have nothing to match it to. As I've mentioned before, in order to really see a colour, we must compare it to other colours, including everything that will be next to it in the same room. 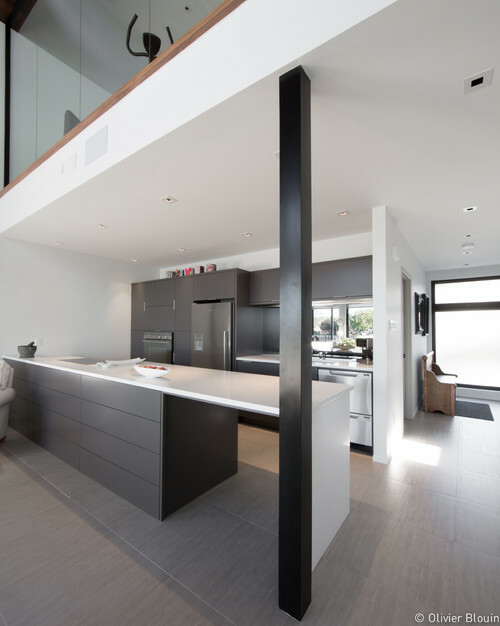 Furthermore, you have far more options for paint colours than you do for your tiles, cabinets, backsplash and furniture. So really the best time to choose the colour for the walls is when the floors are in, the kitchen is installed and your furniture is delivered. The problem we face, is that once everything is done is obviously not the most convenient time to start painting. The result for most is choosing a paint colour blindly. Of course, the choice can be made off of samples. 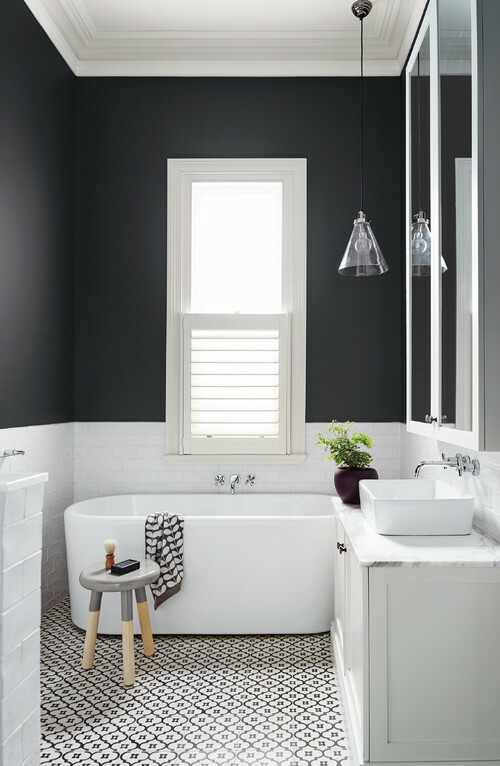 So there's solution number one: choose you floors, tiles, cabinetry and backsplash BEFORE the paint colour; if we have samples of all of the permanent finishes, we can confidently choose the appropriate paint colour. However, you still probably haven't started shopping for furniture or even thought about furniture at this stage yet. Usually, after leaving a client's place who only wanted a colour consultation, I am confident that the paint colour will be beautiful with the kitchen finishes, but still hoping that the client will then choose their furniture based on their wall colour... which is kind of crazy. After weeks of shopping, you may only fall in love with one couch, and that couch only comes in 4 different fabrics. Now what? You have 4 different fabrics to choose from to go with your paint colour or you could have had thousands of paint colours to choose from to go with your couch. It's kind of obvious that we are doing things backwards here. I've had to struggle with this one for a while because I can't control when a client calls me and how far into their renovation it is. The only solution that I can come up with is to plan your construction like and interior designer would. Don't wait until your contractor tells you what he needs next to proceed. Create a concept for your space from the beginning, choose everything even before construction begins, shop furniture as early into the renovation/construction/move as possible. Create a mood board, have a plan, an idea, finishes selected and furniture options. Just don't choose your paint colours blindly because you will be limiting yourself at the next step, when it's time to shop furniture. If you are planning on hiring a designer, this is another reason why it is so important to involve your designer as early into the process as possible. I'm curious to know if anyone else has struggled with this problem and if you have come up with any other solutions, tips or tricks? 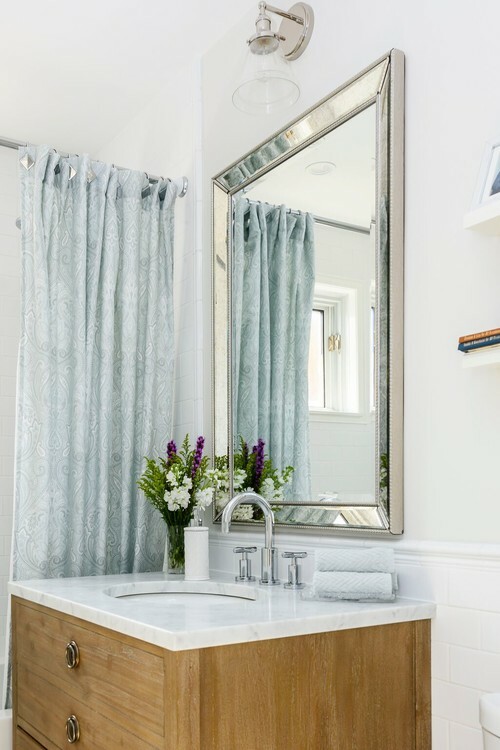 Purchasing a shower curtain may seem like such a petty task until you actually get there and realize how much of your bathroom will really be affected by your choice. Some people even take it into consideration when building their bathroom to avoid it all together. I have literally had clients spend thousands of dollars more to change the configuration of their bathroom and install a glass shower just to avoid having a shower curtain. The SHEER: This was my inspiration for this blog. I have never thought about using a sheer until I stumbled upon this image today. It's simply an awesome idea for a bathroom with a window in the shower to allow the light in. The RUFFLE: These are kind of popping up a little everywhere in different colours. It's fun for a kids bathroom, and it can be very feminin and delicate in the right colours. This curtain is from Anthropology, which actually is one of my favourite stores to shop shower curtains. 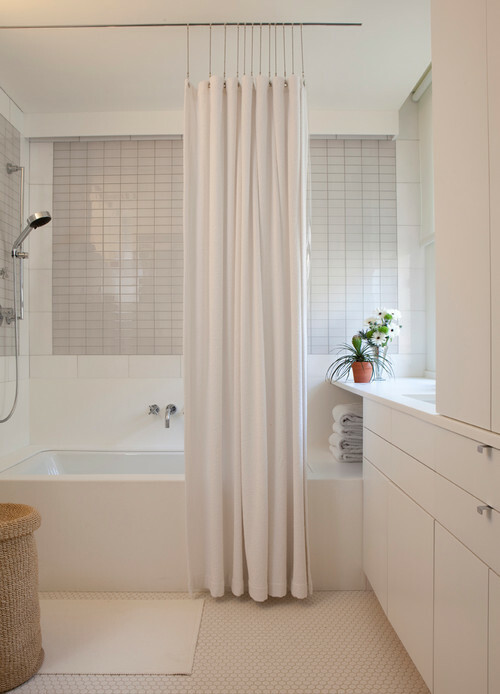 The CUSTOM: This is custom curtain made specifically for this bathroom, you can tell by both the design and the perfect length. You can get super creative with this option; choosing the fabric, embroidery, and borders or inserts, you can also specify the fullness, the length and the hardware. Almost like a window treatment, the combinations are endless. CONTEMPORARY HANGING HARDWARE: There are ways to get creative in the way the shower curtain is hung; whether on this super cool recessed ceiling track or on a regular ceiling track made for standard curtains or a decorative pole. SUBSCRIBE to our mailing list for more design updates and blog posts. If you have recently visited a tile store of any sorts, you would have most likely encountered the next big trend in tiles because we're already seeing it all over the place. I'm really not a huge fan of trends or ultra "trendy" design, as mentioned in this older post. I prefer timeless design that lasts versus renovating every 5 years. Of course, avoiding trends is close to impossible because of accessibility. On that note, I have good news! This is a trend that you can make work forever, since it's not entirely new, we kind of know how it will age. I'll give you two really good examples. I'm sure you've all at one point seen the white hexagon penny tiles installed in an old bathroom. Like this one. If you found yourself with a bathroom with these tiles (but from the 1940s) in good condition, would you feel compelled to rip them out? Probably not! On the other hand, here's example two of a, at one point, really trendy tile that you would most definitely feel compelled to rip out. Can I make this tile work with the right design? Yes. Can the next person who buys your home make it work with their furniture? ... Most probably not. What's the big difference between these two tiles? Well at one point, this terracota orange was considered a neutral. It's kind of how we lather our homes in grey now and consider it timeless. The only true timeless color is white or shades of white. It's clean, crisp and always going to be around. Especially in the spaces that have the most tile, bathrooms and kitchens. Choosing how to work with patterns and colors are also very important. As a guideline, try going with a great pattern in a solid and neutral color, or play around with color more in a less distracting pattern. Unless you're looking to make a statement like we did in this kitchen. 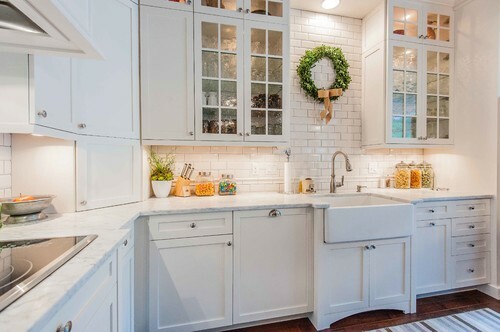 However, you will see that everything surrounding the statement backsplash in that project is pretty much white or shades of it. WHY IS ALL TRIM WHITE??? Over the last five years I've been a strong supporter of white trim (or a close alternative). Trim being base boards, moldings, window frames and sometimes doors. It's clean. It's simple. It can be carried throughout an entire house regardless of the room colour. It's an easy go to colour for the majority of my colour consultations. It's also being done by almost every other designer, contractor, homeowner so it's almost the expected colour for trim. That being said, I cannot wait until this changes. I'm so sick of seeing the same super strong contrast between the trim and the wall colour over and over and over. 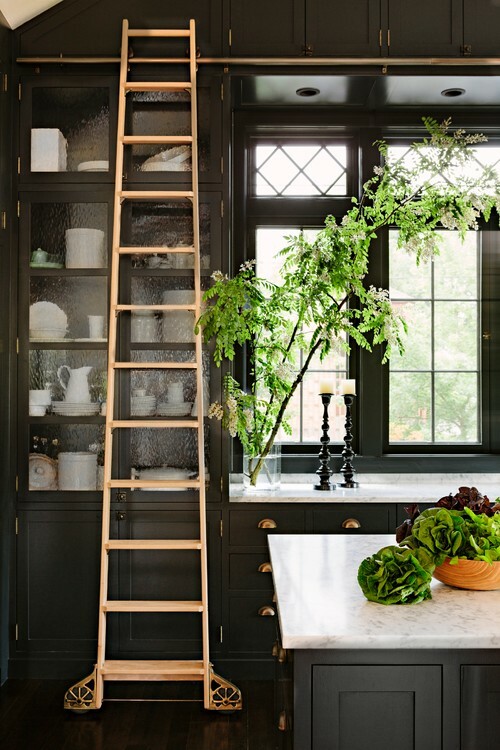 Yes, the goal is to excentuate the trim which is usually a key feature of the architecture of a home, but why not get creative and excentuate it in a different way? CUSTOM CURTAINS: TO PUDDLE OR NOT TO PUDDLE? When going custom for your window coverings, you will find yourself faced with many decisions. You need to choose the fabric, the style, the lining, the hardware and of course the dimensions. 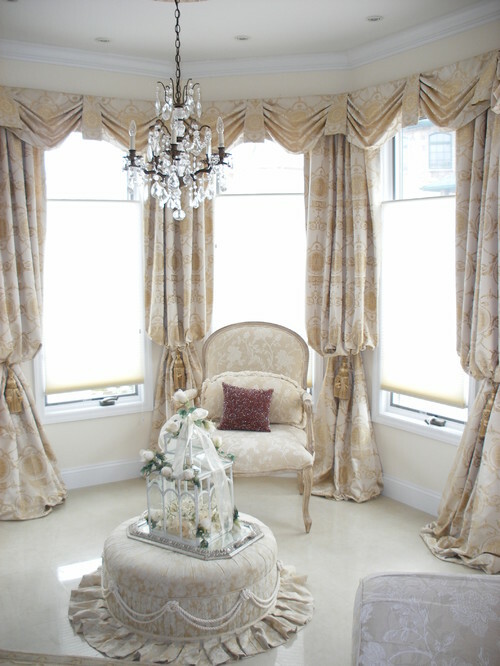 The length of curtains can vary drastically based on practicality as well as the look you would like to achieve. There are several different options available and it's important to know what they are. Curtains that float just above the floor, usually this is about 1/2" to 1/4" above the floor. This is the cleanest look available, however, I tend to steer away from it because the curtains sometimes look too short. Short curtains, for me, kind of look like that old man with short pants, where you see his socks. The reason why they look short is because floors are never really even. So by having curtains just skim the floors, it accentuates this discrepancy when part of the curtains touch and other parts don't. Curtains that just sit on the floors, this is usually a 2" puddle. This is by far my favorite option and the one that I use most often, probably 90% of the time. I love this option because you don't get the crooked floor look that you would get in the option above and the puddle is not long enough for it to look messy. You're also not constantly stuck placing the puddle which makes it still very functional. It even gives your wall a little more height when the curtains sit on the floor. Curtains that puddle 4-6". This option would be used if you like the look, have the room and are okay with placing and adjusting the puddle when you open and close your curtains. Unfortunately, they don't naturally take this beautiful shape when sitting on the floor - so it's a little more work. The very dramatic look of a heavy 12" puddle. This is a look I would only consider for fixed panels. 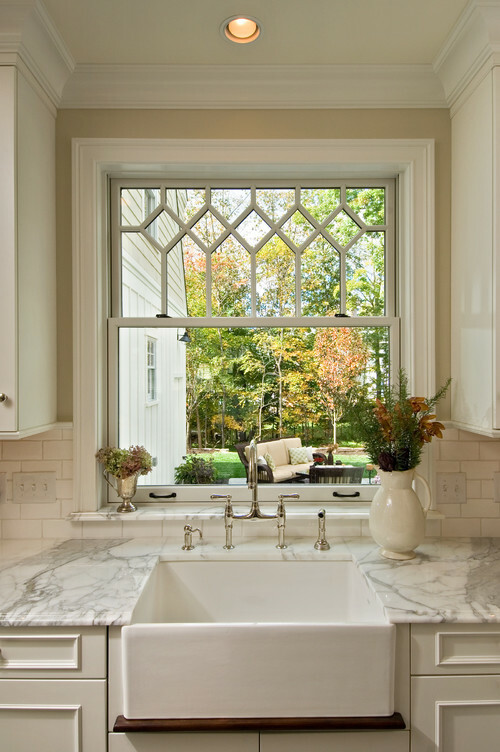 Panels that only serve as decorative features to frame a window, but don't open or close to ever cover the window. It's very annoying to always have to place such a large puddle. You also need the room to be able to accommodate the puddle. You can't have anyone trip over them or have your furniture placed too close to them. While apartment shopping this last month, I came across an absolutely stunning building from the 1920s. It was a combination of the beautiful architecture, high ceilings, large windows and old charm that made this place special. 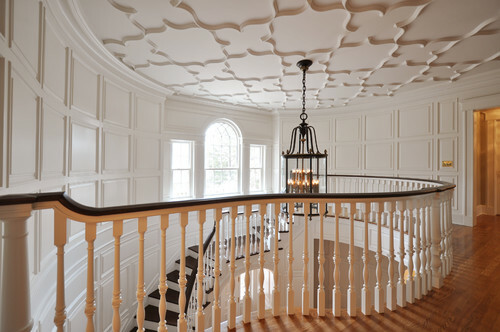 However, what really stood out were the detailed crown molding and ceilings. They kept me looking up the entire time. It was the inspiration for my blog today. Here's the one shot I left with of the entrance and others that capture the same beauty from these unique ceiling treatments. I recently started working on a 490 sq ft, two story loft for a wonderful young couple who are really trying to use every inch in their space efficiently. This even meant choosing a bed without a headboard to save on the room. I soon found myself showing them options of headboard that take up little to no space and I thought it would be great to share in case any of you are struggling with the same issue. A stenciled (or painted headboard take no space at all and it can really easily (and beautifully) fill in that empty space above your bed. I grabbed this photo from a fellow blogger, Liz Marie. 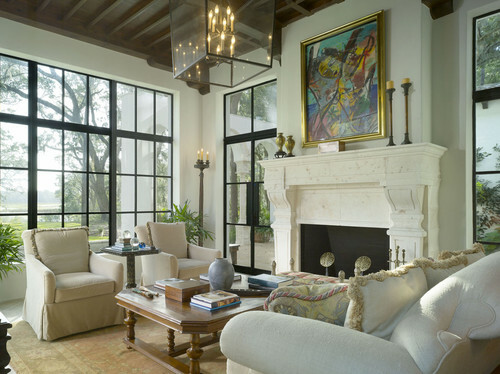 You can also apply this same concept of hanging antique windows to antique doors, empty picture frames, or stained glass windows. All available at any local antique store with just a little shopping around. I love fabric so much that I really try to use it anywhere. I've framed prints that I adore as art, so why not choose a fabulous fabric for a headboard without the space or high price tag of a traditional tufted headboard. 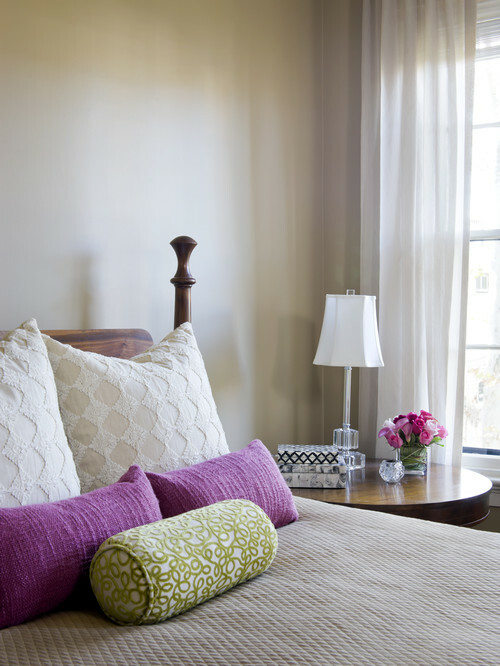 A curtain rod is a great, inexpensive way to create a finished look. What's boho chic? 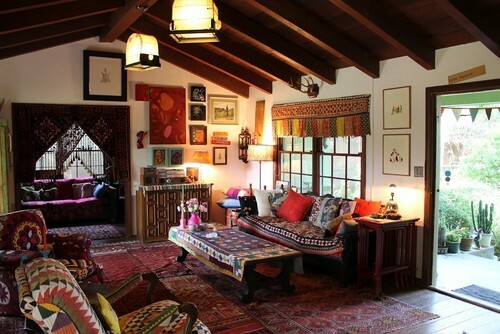 Well to me, (since it's all relative) it's a combination of bold colors, ornate patterns, comfort, busyness and a mix of old and new. 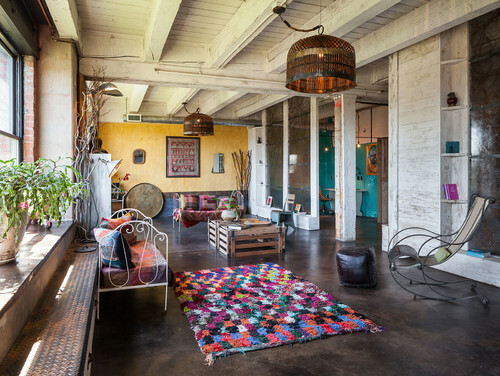 To achieve a good boho look, your place has to look like it's been put together with things that you love that you have collected over the years. It has to look lived in. A place that has not really been designed but looks as if everything works. When does it end? We all know where it start. That daunting, dated blue bathtub, with matching blue toilet and sink staring at you, morning after morning, when you're still half asleep brushing your teeth. Or maybe it's the tarnished yellow (used to be white) cabinetry with plastic handles from the 80's that throw you off the edge. Whether it's one scenario or the other, we've all been there. The question is really where does it end? Okay, so you make the decision to start a renovation. You talk to your partner, set a budget and start calling the trade for quotes. Maybe you even start getting work done before you realize that you are no longer in control of your renovation. Let's paint the walls, and of course the moldings, ceilings and doors. While we're at it, let's also touch up the bathroom because the tiles are too dated. But if we're going to change the tiles, we might as well change the vanity and the mirror. If we change all of that, then the shower and toilet will look dated and all of a sudden we're in the middle of a full blown major bathroom reno. Moving the washer dryer downstairs, moving the bathtub and adding a walk-in shower, installing an electric towel heater, changing the doors and molding throughout the house to match. Because hey! if we're going to make a mess painting, we might as well get the rest done at the same time! So you probably think I'm exaggerating, but this is a true story that I experienced with one of my clients. And I can say that, to some extent, it happens on every reno project. It's hard to know when to stop, which is why you need to plan from the start. If you're not going to be changing everything, you have to make sure that the selections for the new compliment the old that you are keeping. And if you're not comfortable with that, you might want to adjust your budget for a few extra changes along the way or wait until you have the budget to do it all at once. The last thing you want is to spend money changing a countertop that will only make the tiles beside it look even more dated. On the other hand, if you need help choosing the right countertop to compliment the dated tiles, that's where I come in! There are a few different ways clients come to me; most are from referrals, a few from Houzz, and some from my website. Of all the clients I get, the ones I get along with the most are usually those who have read my blog and contacted me partially because of it. I wouldn't say it's necessary for your designer to have a blog but it definitely helps. First of all, it's important for an interior designer to have an opinion and be comfortable voicing their opinion. You are paying for their opinion and explanation for the choices you make together. Secondly, an interior designer who blogs is most likely reading blogs and educating themselves. You can rest assured that if your designer is blogging, they are current with trends and new products. Sometimes designers will get used to a design style that works for them and just reuse and repeat. This is probably not something that you want unless you love what the designer has already done and literally want a duplicate. It's important for them to be innovative, and involved in the industry in my opinion. Finally, blogs gives you a glimpse of the designers personality. Working together is a very personal experience. It happens that I get clients that I just don't click with. I'm not saying it doesn't work out in the end but it does take longer to understand each other, feel comfortable sharing opinions with each other and overall making it a fun experience. It does eventually get there as you get to know each other, but it definitely helps when there is an instant connection. Their blogs can give you an idea about what's important to them and help you determine if they are the right designer for you. Most of us have finally accepted that bedroom furniture no longer consists of a 6 piece solid wood matching set that you will buy once and keep for life, then eventually pass down to your children. Great! Next challenge: trying to convince everyone that your night tables don't have to match. In fact, it would look a lot better if they didn't. I love mixing night tables of different sizes, materials, shapes. There are many ways of doing it for it to look right and here are a few examples of things to look out for when shopping night tables. 1. If you're going for two completely different styles, materials and shapes. Try to find pieces of a similar size. 2. Open your options. They don't both need to be night tables. One can be a desk, a dresser or a hutch. Find pieces that you love that will be practical for you. 3. Your table lamps, artwork and accesories also don't need to match. The key is trying to achieve a proportional balance. 4. Get creative with the different mateials used. Mix mirrored, silver leaf, wood, painted, vaneered. There are tons of different textures that when pulled together marry well. Especially with a beautiful tufted, upholsted headboard. 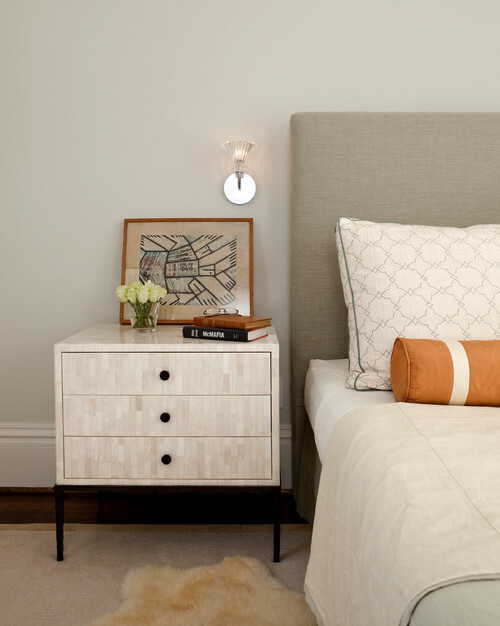 It's these design details that will really make your bedroom wow! 5. Take this idea outside of the bedroom and have the same mind set when shopping for living room end tables and other accent pieces like table lamps. Start questioning where you would typically think of putting something symmetrical and identical and look for fun alternatives. A great thing about having random pieces in your home that have multiple functionalities is that you can move them around from one room to the next. Bored with your living room? 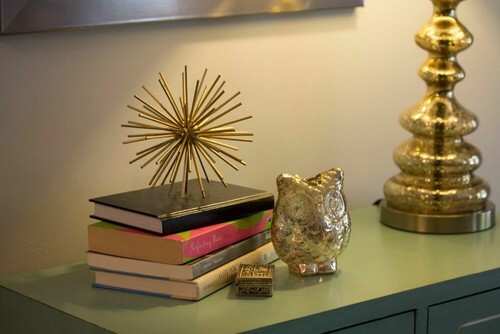 Swap the end table for one of your night tables in your bedroom. The only way to work efficiently with a designer is for them to understand your needs. These simple tips to preprare for your first consultation can get your relationship off to a good start. 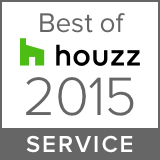 Share your style through Houzz. 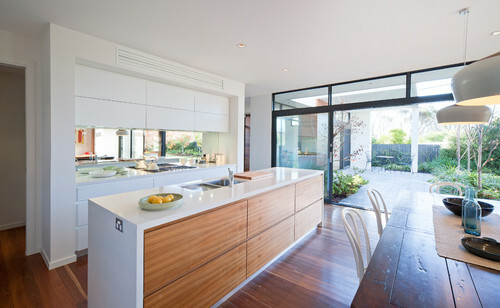 Create an account by logging on to Houzz.com, create an Ideabook and share it with Triandos Creations. In your Ideabook, include all of the photos of styles that you would like to see in your space. If you're not very computer friendly, you can share your style by magazine cut outs and images you've seen of styles you like. Make a list of the pieces of furniture that you are keeping. Think about functionality. What will you be using your space for? Is there anything you would like to accomplish in the space that you are not currently able to due to the design? Determine a budget. It's very important for your designer to know how much you want to spend. This will save you both time because they will avoid shopping for and showing you pieces that will not fit into your budget. This will also help you get the biggest "bang for your buck" since your designer will work within your budget to get you the biggest effect. Think about how you would like to work with your designer. Do you like to be hands on every step of the way? Would you like to shop together and make every single decision together? Maybe you would prefer if your designer shops for you and sends you pictures of the items for your approval? Or, you might not want to be involved at all and just give your designer "carte blanche". Once you've covered these simple steps, you are sure to make the most of your first consultation. With the progress of my career, I am trying to find ways to make a positive impact on our planet and in our society with what I do for a living. One approach is for me to promote timeless, long lasting designs by purchasing good quality pieces as well as designing with a style that will age well. I am noticing an abundance of low quality furniture made overseas, purchased with the intention of it lastng for just a few years. Only for it to be replaced in order to follow future trends. This concept appeals to consumers on a budget or to those who enjoy changing their decor often. It may, on the surface, make sense, but I believe that there is a better way of doing things. "Temporary" furniture usually ends up on a curb which contributes to the pollution of our earth and consumerism. Ikea is now used in both dorm rooms and million dollar homes. In both scenarios, it is considered temporary furniture, that's not built to last, yet we are seeing more and more of it. We are constantly promoting recycling but not focusing on preventative measures for wasteful and excessive purchases. Follow these guidelines to achieve a timeless style with solid furniture that should last a lifetime. This sometimes means that you may have to take your time until you can afford at least a medium to high end collection... even if you are living in an empty space! When ready, do your homework. Every salesperson will insist that their product is of excellent quality. Look up reviews, check the craftmanship of the item you are considering. Ask where it is made and if there is a warranty. 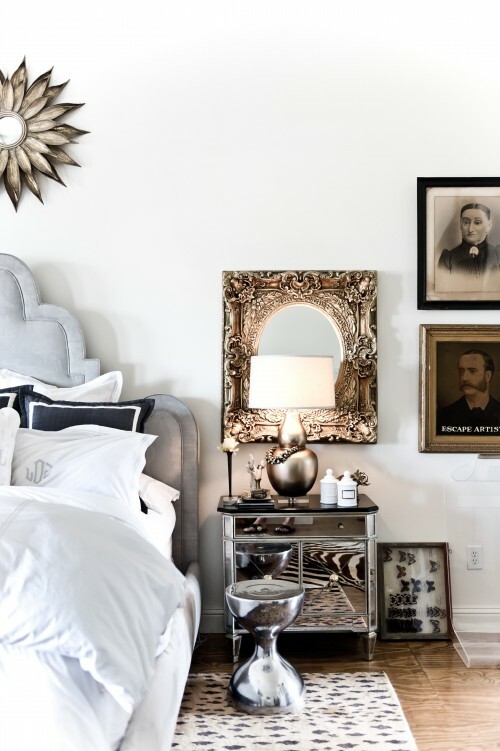 Eclectic styling is truly one of the most timeless ways to decorate. If you are mixing and matching different collections, finishes, styles, with signature pieces that you love, you are garanteeing a timeless design. What's more is it allows you to constantly change the layout of the furniture in your home since you are not limited by the style in each room. This comes very useful when moving or when you just need a change of scenary at home. Do not settle. Yes, shopping can be very tedious. It can be exhausting and frustrating and sometimes we just settle for what's available now instead of going the extra mile to find what we really want. It is important that you keep an open mind when shopping since you may be inspired by pieces that you wouldn't have initially considered but we must never feel that we settled. You would be surprised by what you really need to survive. If it means eating dinner on the coffee table for an extra month, it's usually worth the wait. If you are in a rush, hire a designer. Show them pictures and ideas of exactly what you are looking for and they would save you time by presenting you options both online and locally. Most importantly, be excited about the choices you make. Your home is your canvas that should describe you - have fun with it! These two special rooms are probably my favorite to decorate. The entrance is very important, yet so often neglected or put off to last. It is the first place we see when entering our home and the last when leaving. It should welcome you with warmth and style and leave you feeling like you can't wait to be back home when you're on your way out. 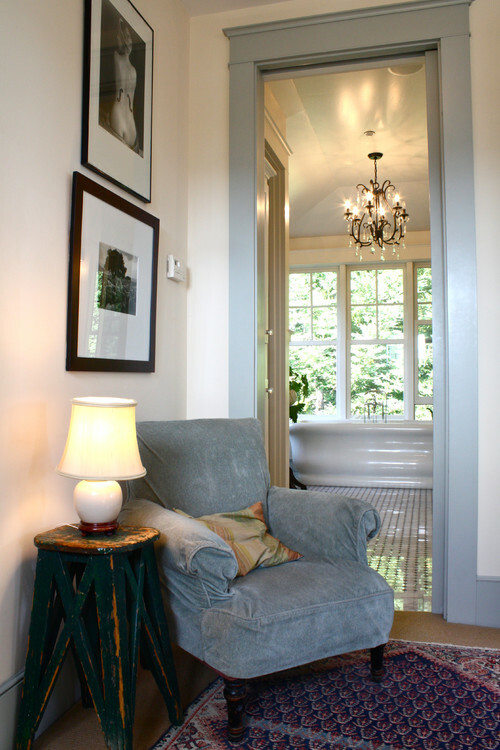 Both the entrance and powder room are where you can allow your creativity to soar. They are usually confined spaces, seperated by doors where there isn't much functional furniture. This is where we can be different, not logical, artsy, bold. I like to use graphic wallpapers, loud colors, oversized light fixtures, unique accessories and dramatic accent furniture to make these spaces scream "Look at me!". Here are some great examples of what I mean. I fell in love with this idea, reblogged from Design Sponge. Prettypegs replaces the boring cheap legs from ikea furniture... I guess it would work on other furniture as well. It's so simple yet makes a huge difference. WHEN IS IT OKAY TO PAINT WOOD FLOORS? The answer to this question is really simple - when the floor is so bad that you really don't have any other option. It of course has to suit the space. This look is perfect for a country cottage or a sunny attic. It's not exactly suitable for a formal dining room or city loft. 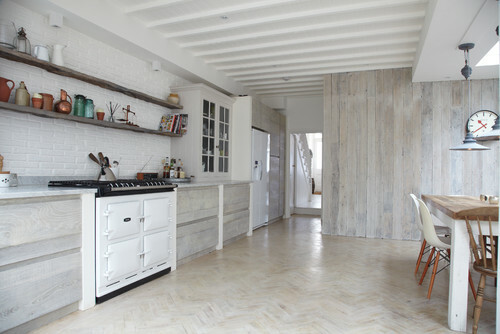 From all of the images I've seen of painted wood floors, I've always wanted to try it. I've just never found the right situation. I love the way it looks in pictures but actually living with painted floors (that are usually white), is a little high maintenance. You have to be okay with scartches and scuff marks that will come up with time, but I guess that just adds to the beauty of them. -or just go with a crazy pattern!